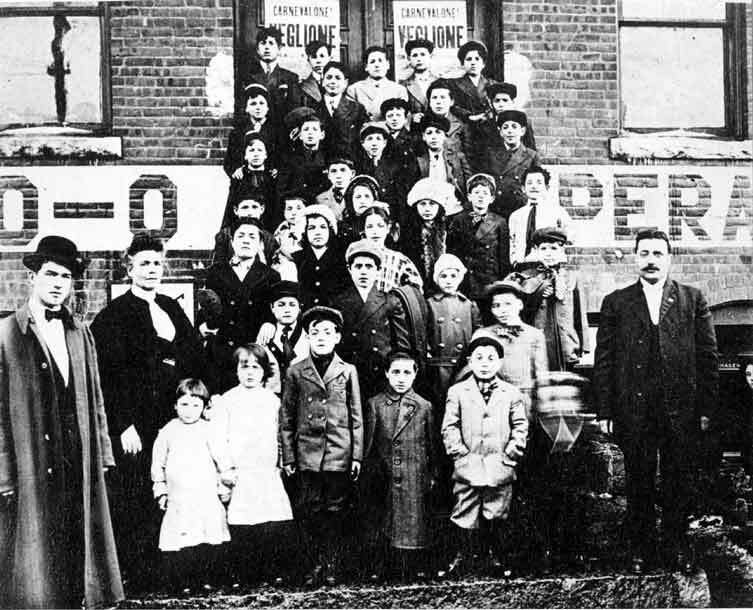 Barre and Lawrence, Massachusetts, have shared a common bond ever since the Lawrence textile strike of 1912, when the working people of Barre supported this important strike with money and care for the strikers children. That bond has continued through the years. 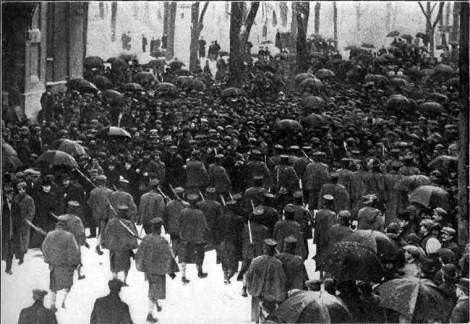 Organized by the Industrial Workers of the World (IWW), then a relatively new labor organization that quickly earned a reputation for not flinching in the face of private Mass demonstration of strikers and militia security forces police or the National Guard, the strike was characterized by massive demonstrations of tens of thousands of strikers, flooding the main thoroughfares of Lawrence. The women were particularly militant leading District Attorney Harry Atwell to complain, “One policeman can handle 10 men, while it takes 10 policemen to handle one woman.” The women strikers were full of “lots of cunning and also lots of bad temper,” a stunned boss complained. 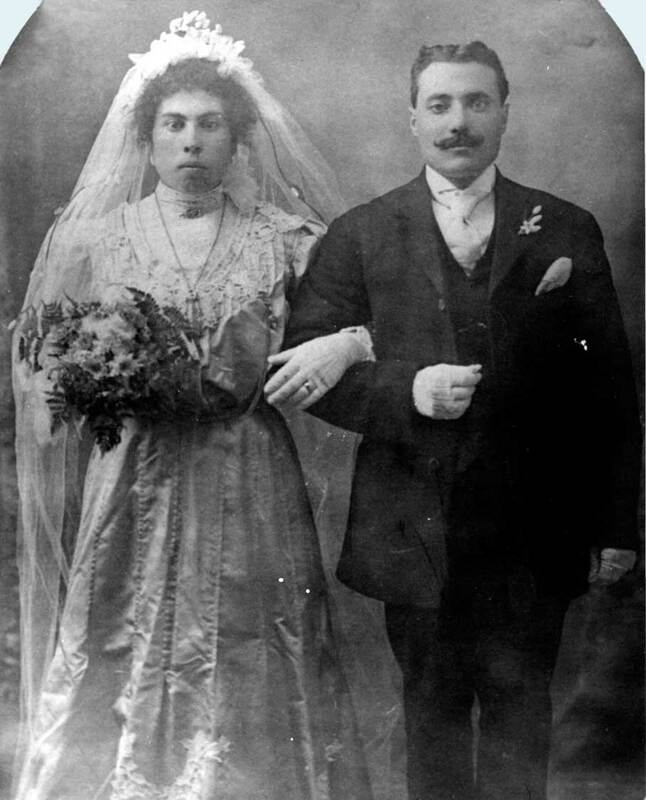 On January 28, 1912, Just over two weeks before the children were taken into Barre homes, Anna LoPizzo, an Italian immigrant striker, was struck by a policeman’s bullet while watching a confrontation between security forces and demonstrators. The headline from the Evening Tribune the next day demonstrates the attitude of the press coverage – an nameless striker versus a fully identified police officer. For those opposing the strike, her death was nothing more than a pretext for arresting two of the strike organizers. Very little is known even now about Anna LoPizzo. 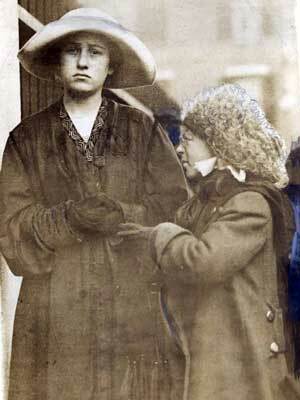 She bled to death in the street—the first martyr of the Bread and Roses Strike and one whose troubled legacy would not be determined until almost eighty years had passed. The memorialization of her legacy would once again call upon the citizens of Barre. 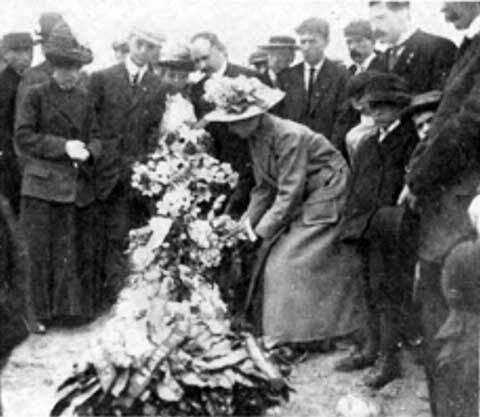 Historian Bruce Watson wrote: “If America had a Tomb of the Unknown Immigrant…Anna LoPizzo would be a prime candidate to lie in it.” Like countless others who came to America seeking a better life, she was directed to Lawrence, Massachusetts, where giant textile factories employed recently arrived immigrants. On the last day of January a Lawrence undertaker opened his funeral parlor to allow thousands to view her remains in an open casket. To the strikers she was not some nameless troublemaker, but one of themselves. Lines extended for several blocks as they passed her body. Within the procession a sense of outrage flourished, and the militia was again summoned to quell any potential disturbance. She had lived in a rooming house and, although she wore a wedding ring, no husband attended her funeral. Only one mourner, an uncle, came to her memorial mass. Dave Morris, a native of Lawrence and a retired union official observed that mourners wished anonymity for fear that employers would refuse to hire workers sympathetic to the strikers. In fact, her funeral expenses were paid by an unnamed benefactor to protect his or her future livelihood. Her remains were interred in a pauper’s grave at Immaculate Conception Cemetery and, for eighty-eight years, the site was unmarked by anything more than the falling leaves that covered her grave every autumn. In the 1990s, as the memory of the Lawrence Strike became a focal point for an annual Labor Day festival in that city, Dave Morris met another Lawrence native, Dexter Arnold, who enlisted Morris in his quest to find Anna’s grave. Using cemetery records and maps they were able locate the site of her burial and, after clearing the brush and other detritus from her plot they set about finding a way to honor her memory. A local monument dealer helped them contact the Granite Cutter’s Association in Barre, and the union’s agent, Matt Peake, called Jeff Martell of Granite Industries of Vermont. Jeff has been in the granite business since 1978 and has deep roots in Barre. He was aware of the great sacrifices and accomplishments of organized labor in the Granite City and, although he sits on the other side of the bargaining table from the unions, he immediately saw the importance of the project. “We’ve done this sort of thing before,” he said, and noted that more recently his company donated a marker for a Vietnam veteran’s grave whose request for a marker was unfulfilled due to bureaucratic complications. 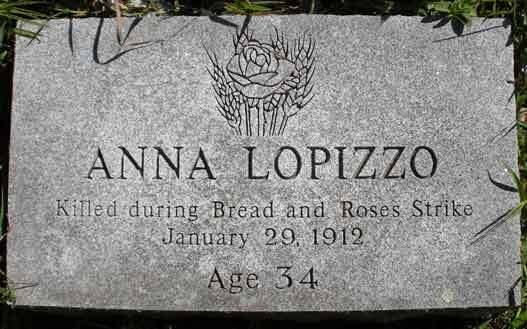 A handsome granite marker, Anna’s stone, carved in the famous Barre Gray granite, bears the symbolic logo of the Bread and Roses Heritage Festival, a rose surrounded by a sheaf of wheat and finally, Anna’s memory has been honored in perpetuity. 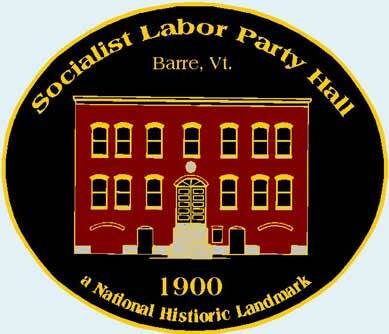 On Labor Day, 1997, members of the Barre Historical Society, took the giant blow-up of the picture of the strikers’ children posing outside the Old Labor Hall, down to the annual Bread and Roses Festival in Lawrence, Massachusetts, in hopes that people there would be able to identify the children who came to Barre to be cared for during the strike. Some of the children and adults had already been identified by means of more conventional research techniques. Although going to Lawrence for a festival was like looking for a needle in a haystack, members thought it would be a nice day out and a change from the staid atmosphere of libraries and archives. The festival organizers were very excited about the project and were delighted to be able to offer to people from Barre a small recompense for the help for the its citizens received over 80 years before. The Lawrence Eagle-Tribune featured an article about the search for the children on its front page the previous day. The local cable-TV channel included the trip in its Festival coverage and the Eagle-Tribune‘s reporter hovered around waiting to see if any children would be identified. 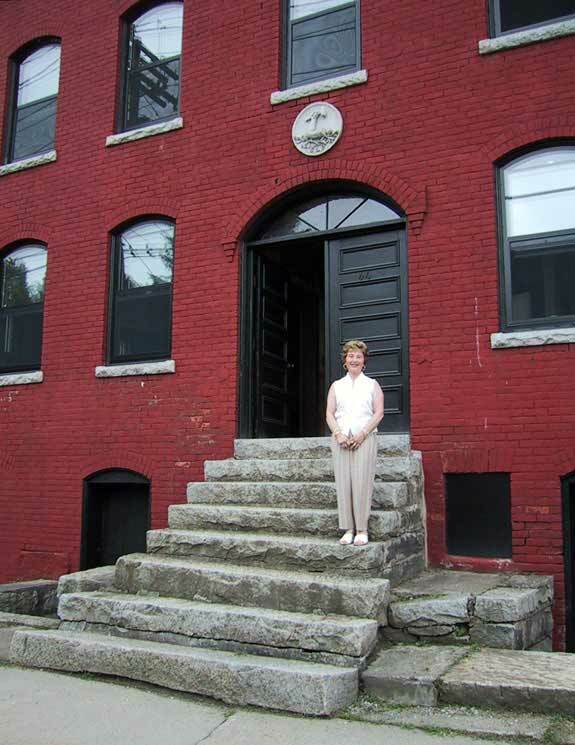 The Barre Historical Society member s had developed a brochure describing the project and listing the individuals whose names were already known. The individuals on the picture were numbered so that there would be no doubt which person was meant and so that people could take the brochure away with them to show to relatives who could not make it to the festival. Slowly, older people began to arrive and diffidently point to individual children in the picture and explain that they were parents or other relatives. Others talked about their days working in the textile mills. An elderly gentleman walked up to the picture and pointed to the grown man standing on the right-hand side of the picture. 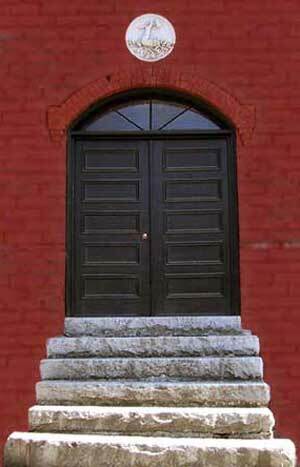 Introducing himself as Salvatore Savinelli, he said, “That’s my father.” The Historical Society members were a little taken aback since the man had already been tentatively identified as a Barre organizer and had been named in the brochure as Tibaldo Rossi. 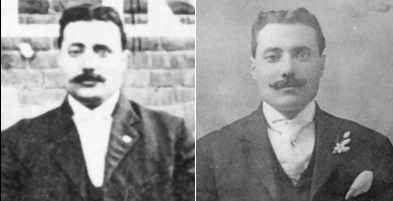 Mr. Savinelli said, with evident pride, that his father, Angelo Savinelli, had been one of the textile strike organizers, and that the white spot visible on his lapel was his union badge, which he wore always. He saw that the Historical Society members looked skeptical. He said that he would get us a copy of his parents wedding photograph and we would be convinced. He pointed out the man’s “sleepy” eye and said we would see it in the wedding picture. A comparison of the two pictures soon confirmed that the man in the picture was indeed Angelo Savinelli. On returning to Barre, researchers reviewed the newspaper reports of the strike. There in the February 20,1912, issue of the Barre Daily Times, was a letter to the Editor, discussing the news coverage of the children and signed by “A. F. Broggi, Delegate from Barre” (the adult man on the far left of the picture) and “A. Sassinelli [sic], Delegate from Lawrence.” (The press’s misspelling of immigrant names was even more common in the days of hand written letter.) This discovery, along with the Savinelli wedding picture seems to have finally resolved this case of mistaken identity. One other question remains. Standing next to Angelo Savinelli, on the same step, is the smallest child in the group. He must have been very young and had difficulty standing still for the long time required for photographs in the early twentieth century—and so he is nothing but a blur. Was that little Salvatore standing next to his father? 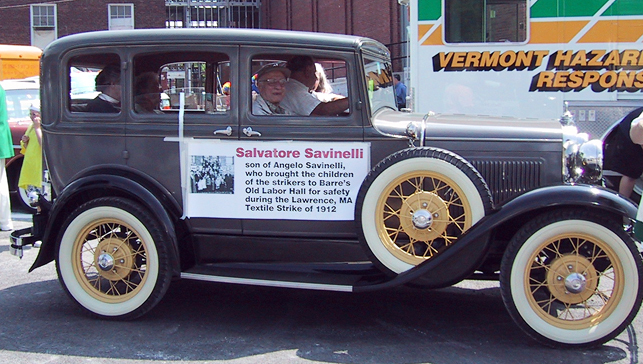 Mr. Savinelli, who would have been around four years old at the time (died in 2013 at age 104), remembers a number of things about the strike, but he does not remember whether he accompanied his father and the other children on the trip to Barre. The members of the Barre Historical Society were delighted to meet several descendents of the strikers’ children, but that was not the end of the connection between Barre and Lawrence. 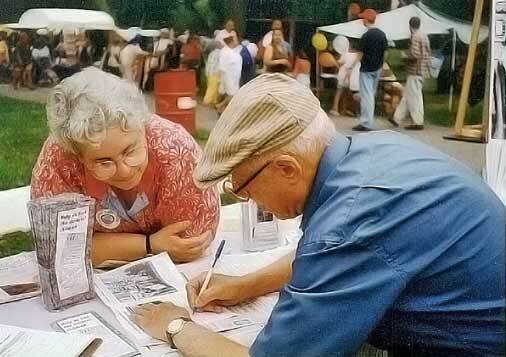 Since then there have been many contacts between the Socialist Labor Party Hall and the descendants of the strikers. 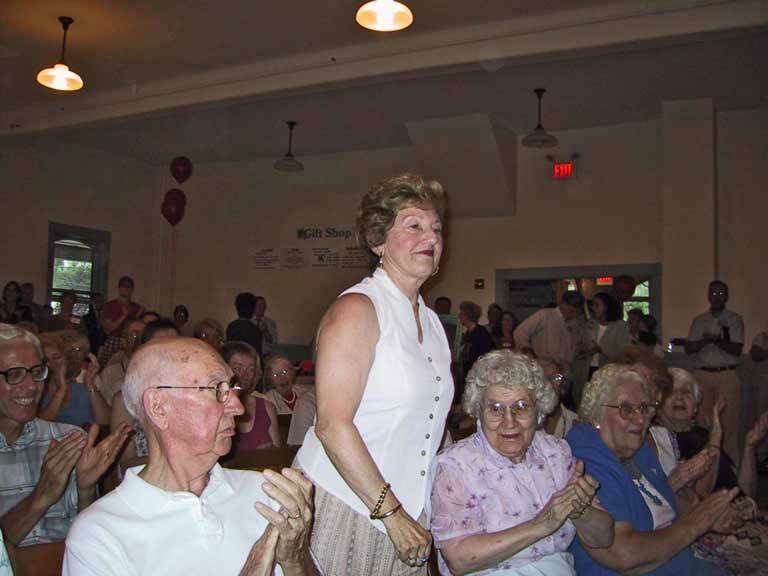 On the Grand Reopening of the Socialist Labor Party Hall on September 2, 2000, over 60 years after it had ceased to function a a center of community, labor and political activity, Shirley LaFontain came all the way from near Lawrence to participate in the festivities. She stood on the steps where her relatives stood as children and spoke most movingly about what their sojourn in Barre had meant to them. For the Barre annual Homecoming Celebrations in the summer of 2002, Mr. and Mrs. Savinelli kindly agreed to come to Barre with their daughter to participate in the grand parade. The Barre Historical Society presented Mr. Savinelli with the lapel pin commemorating the Socialist Labor Party Hall—in memory of his father’s union badge that he wore so proudly in the picture. Over the years the connection with Lawrence has continued and grown stronger. 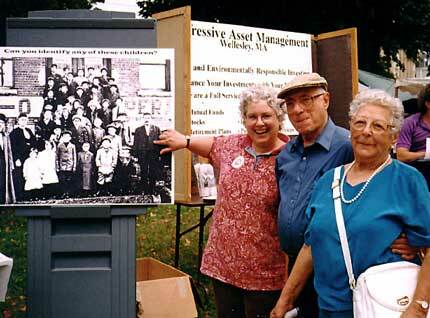 The Barre Historical Society has provided travelling exhibits for the Lawrence History Center museum and participated in the Bread and Roses Festival. The centennial celebrations of the Lawrence strike and Barre’s part in it have only strengthened this relationship. Here’s to the bicentennial. May the history of this strike never be forgotten!